There are club sets designed specifically for all levels of play. As a beginning golfer, you are excited to get all the golf gear that you need to get out on the course and master the game. But don't let that initial enthusiasm force you into a poor investment. 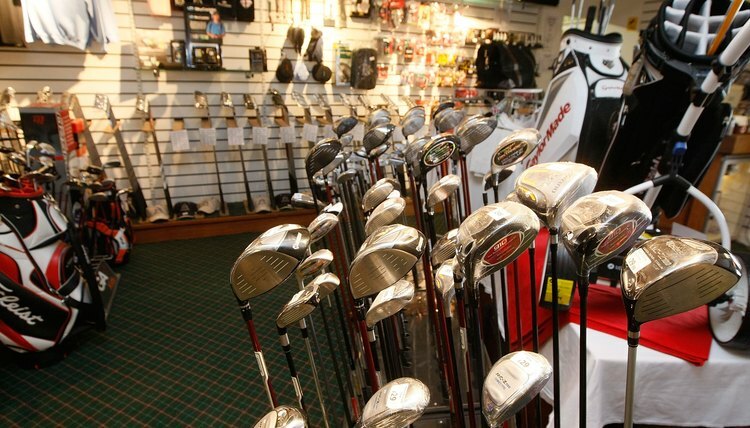 Golf equipment, especially a set of golf clubs, is something that you should ease into as you progress with your game. Read on for suggestions on how to make the right choices throughout your game development. Buy your own beginner set of clubs. At this stage, custom fitted and/or top brand name clubs are not needed and will prove to be an expensive lesson learned if you quit playing the game. Go to a discount golf or department store and purchase a basic beginner set of clubs. It will likely include a driver and 3-wood, odd numbered irons (3, 5, 7 and 9) and a putter, as well as a bag to carry them in. You will, of course, make the basic decisions between men's and women's and right or left-handed clubs. Beyond that, you may have a choice between steel and graphite shafts. As a beginner, get the steel shafts that are more durable and less expensive. This will get you started in the game. Step up to a full set of clubs after you have played for a year or so and are beginning to look at improving your game. It will normally include a driver, 3 and 5 woods, and 3 through PW (pitching wedge) irons. You will normally need to select a separate putter. A blade type putter is a good one to start with. The set will not include, and you will not need at this stage, specialty clubs such as wedges (sand, approach and lob wedges), long irons (1 and 2-irons) and additional woods (7, 9 and even numbered woods). You will again have a choice between graphite and steel shafts. Stick with the steel at this early stage in your development. You should also consider offset heads (to increase trajectory or reduce a slice) and cavity back irons (to enlarge the "sweet spot") that are helpful to the high handicap golfer. Complement your basic set with some specialty clubs such as a sand or lob wedge, as your game improves. A 60-degree lob wedge is particularly helpful for escaping greenside trouble. If you have trouble with fairway woods, you may wish to try a long iron (such as a 2-iron) or a hybrid club that combines the benefits of a wood and an iron. If your trouble is with long irons, you may wish to replace a 3-iron with a 7-wood. But remember that you are only allowed a maximum of 14 clubs in your bag without incurring a penalty. If you're having trouble with putts, you may wish to change your putter from a blade to a mallet. For a par golfer, 50 percent of the shots are with the putter. Begin to use better golf clubs that are best suited for your game as your game continues to improve over a few more years. By now you know that you are a committed golfer and the investment is much less risky than when you began playing the game. For this set of clubs, add to your consideration the top brand names, grips, graphite shafts, stiffness of shafts, cast or forged irons, offset heads, cavity back heads and most important, custom club fitting. Custom fitting will tailor the club shaft length and flex and the club head lie angle and loft to your particular size and swing. It is well worth the added cost if you are set on becoming a serious golfer. As you fine-tune your game, you may wish to consider a belly putter that is having increasing popularity with the pros.